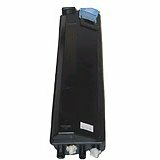 This is a genuine Mita 37098011 Black Laser Toner Cartridge guaranteed to perform with the Mita DC 1460 / 1470 Laser Toner Copiers. — One 210 gr. Black Laser Toner Cartridge per carton.